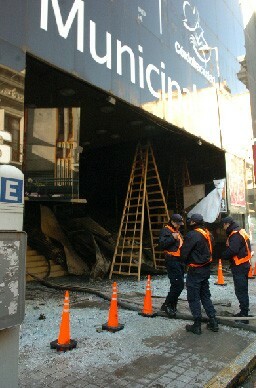 Everybody connected with Cumbres Borrascos (Wuthering Heights), a rock opera which was to have premiered in Cordóba, Argentina, is feeling devastated at the moment, because the theatre burned down just before the first performance. Thanks to our friends at Bronte Blog for telling us about this. Joan Quarm, long time Brontë Society member, 87 years of age, still working, still making the news, still going strong. What a Jewel in the Crown!!! So who is he? According to a spokesman for Eddisons, which conducted the auction yesterday, a large property investor who comes regularly, a man in his late 30s or early 40s who lives in London, has bought the place on a whim. Apparently, he does not know what he is going to do with it, but he says that he is not going to adapt it for buy-to-let. The Brontë Society is in no position to take it on. The local paper, the Telegraph and Argus, is polling online readers on whether Bradford Council should buy it and run it as a tourist attraction. So far, a substantial majority thinks it should. But then, Bradford Council tends to take Haworth and the Parsonage for granted, doing very little: the old toilets run by Bradford in the village are inadequate and dirty and the famous setts (cobbles) on Main Street are poorly looked after. There were insufficient bids for Lot 53 today at the auction held in Leeds United's Banqueting Suite at Elland Road. Therefore 'No Sale' was declared for the Brontë Birthplace in Thornton. The guide price had been reduced from £200,000 to £180,000 previously. A series of striking new paintings by artist Victoria Brookland will be exhibited shortly at the Parsonage, which has been developing a reputation for bold projects with visual artists, most recently Turner-prize nominee Cornelia Parker, as part of its much praised contemporary arts programme. 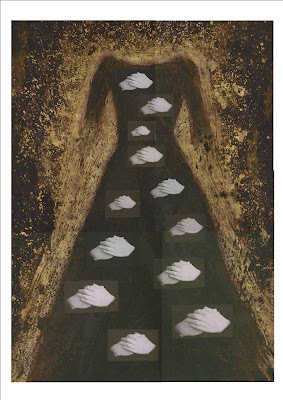 Secret Self, the new exhibition, features fourteen works by the Leicester based artist, who has used dresses in the museum’s collection as her inspiration, transforming them into powerful evocations of the Brontës’ enduring mystery. The exhibition is part of a programme of events that has recently included a visit to Haworth by the Poet Laureate, Andrew Motion, an event at the National Portrait Gallery with artist Cornelia Parker and an exhibition of giant photographs produced through a collaboration between local photographic artist, Simon Warner, and a group of visually impaired youngsters from Bradford. The Secret Self exhibition opens on Sunday 1 July and runs to Sunday 30 September. Admission is included in the normal museum admission charge. 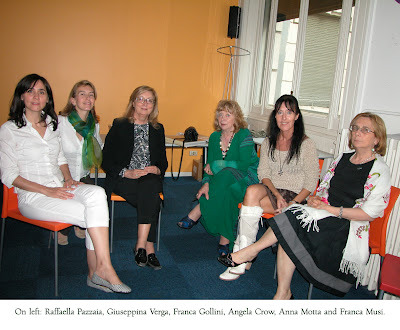 An enthusiastic group of members of the Italian section of the Brontë Society gathered at the British Council in Milan on 26 May 2007 to meet Angela Crow, who introduced her latest book Miss Branwell’s companion. It was a great honour to have Angela with us and to be introduced to her work, which was presented for the first time to an audience. Her talk was very interesting and let us know more about Maria Branwell, the Brontes’ mother, a clever and sensitive woman. At the end of the lecture Angela signed copies of her book and then we had a lovely English tea party offered by the British Council. Thank you, dear Angela, for your clever, involving talk and for your friendship. We hope you will come back to Italy soon! Rachel Angela Daniggelis, 8 weeks old, has confided in me her desire to become an Angrian when she comes of age (4 years). Until then, her Brontë library consists of this new volume* beautifully written and illustrated by Mary Haig, Region 10, US Brontë Society Representative. It is a gift to Miss Daniggelis from US Brontë Society Representative Theresa Connors, to whom we give our thanks. Coming back to reality (and the office) after a weekend in Haworth, I think I know something of what the Brontë siblings must have felt on returning to their teaching duties after a holiday at the Parsonage, exchanging literary enthusiasms on moorland walks! It is of course not just the organised events, good as they are, that make the Brontë Society's June AGM weekends so memorable and bring members back year after year. It is the combination of the setting - Haworth and the rolling moors around, with long summer days to walk on them - and the opportunity to meet lots of other members. It may not be the best weekend of the year for communing in solitude with the spirits of Charlotte or Emily, but no-one who welcomes the chance to talk over Brontë passions with like-minded enthusiasts on café terraces in Main Street, in the lounge bar of the Old White Lion or while striding over the moors, should miss the June AGM. Brontë Society members are such a varied lot, coming from such a range of ages, nationalities, occupations and backgrounds. Some grew up in the area, others run overseas branches of the Society at the other side of the world, in America or Australia. Some were brought to the Parsonage by creative projects requiring research (I met a choreographer who has created a ballet about the Brontës and a playwright who's written a play about them). Each member has his or her specific interest or story to tell. There's the lady who has a Brontë room in her house, and the member who's amassed a collection of around 500 Brontë-related books over the years. I spoke to couples who had met through the Society and people who'd formed some of their best friendships with other members. The 2007 AGM weekend followed the usual pattern. By Friday evening the Haworth Bed and Breakfasts were bursting at the seams. 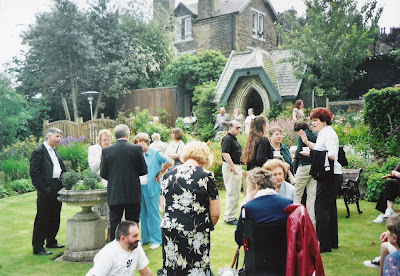 The meat of the weekend was on Saturday, with a morning lecture, a garden tea party, the AGM itself, and a discussion on "Brontë lives" by the biographers Juliet Barker, Lyndall Gordon, Rebecca Fraser and Edward Chitham (biographer of Anne). Barker, Gordon and Fraser told the audience why they had believed that new lives of the Brontës were necessary. They had all wanted to demolish myths and stereotypes created by previous biographers, starting with Mrs Gaskell. Juliet Barker, who had approached her subjects as a historian rather than an English literature expert and chosen to write about the whole family instead of an individual member of it, had in particular set out to correct the stereotypes of Patrick, Branwell and of course Haworth itself. The programme on Sunday was lighter: readings in the morning and an afternoon walk on the moors, followed by a film. Interestingly for Selina Busch and myself, as representatives of the Brussels group, the readings this year included a substantial Belgian component: one of Emily's Belgian essays and William Crimsworth's first impressions of Belgium in The Professor. The 2008 AGM will be held over the weekend of 7 - 8 June. 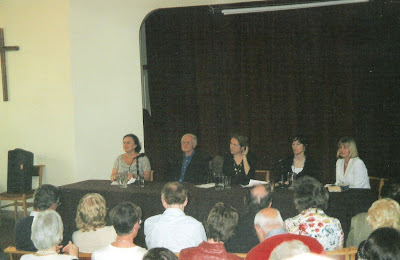 Thanks, Selina, for this picture of the four members of the biographers panel on the Saturday evening. From the left we have Lyndal Gordon, Edward Chitham, Justine Picardie, Rebecca Fraser and Juliet Barker. 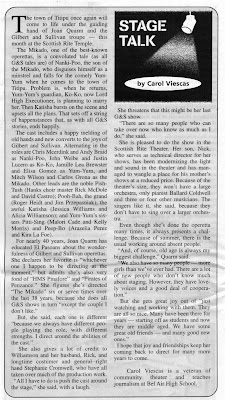 For those who weren’t there, here are my recollections of the Brontë Society AGM I attended last weekend. I had been looking forward to it so very much, not having been there last year; I have attended several AGM events in previous years and come to know and love so many friendly people. It was mainly because of the people I wanted to go back to Haworth, and to my beloved England. When the bus from Keighley slowly approached the Haworth valley, and I saw the village appear on the horizon, I knew I would soon be at my favourite place; my ‘home from home’. Friday kicked off at 2.00 pm with an interesting and entertaining talk by Victoria Glendinning, called Writers and their Houses. She discussed how the research of biographers and the curiosity of us readers makes us want to know all about the private lives, including the homes, of our favourite writers. Since the unromantic reality frequently fails to satisfy our curiosity and preconceptions, we hope to get closer to the creative origin of the fictional world of the writer by visiting their homes, now often turned into museums or owned by the National Trust. She dwelt in particular on the special atmosphere of the Brontë Parsonage, how small it is, and on Haworth. The following day saw the usual Saturday programme of a lecture, church service, tea at Ashmount and the AGM. The lecture this year was given by Scottish professor Douglas Gifford, and was called: Border cousins: James Hogg and Emily Brontë. 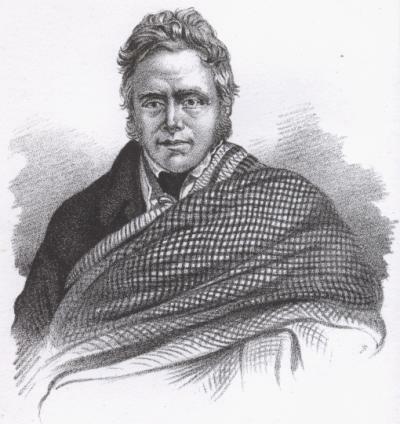 James Hogg made his reputation in 1824 with his popular novel The Private Memoirs and Confessions of a Justified Sinner (a gothic novel about religious mania with a psychopathic hero). Gifford explored the thesis that Emily, who would surely have read his work, took inspiration from characters of folklore, such as the ‘Brownie’, for the creation of Heathcliff. This year is the 150th anniversary of Mrs. Gaskell’s Life of Charlotte Brontë, and during the annual service in the Parish Church, we were treated to an excellent address by Patsy Stoneman about the enormous impact of this ‘novel-like’ biography, and some readings of the book by Jean Bull. Afterwards we had a pleasant afternoon tea at Ashmount, made even more agreeable by the lovely weather we had been blessed with all weekend, and the setting of the beautiful garden. Time passed by very quickly, as it always does on this busy day, and we had to rush off to the AGM, which started at 4.30. It was, on the whole, business as usual, but some eyebrows were raised with regard to the Society's continuing financial deficit and the new development plans, with seemed to cause concern to some members. I had been looking forward all day to the evening programme, which I anticipated would be the highlight of the weekend. At 7.30 we were gathering in the West Lane Baptist church once again (all the comfy chairs were quickly occupied!) for a panel discussion chaired by Justine Picardie, featuring some big names in the Brontë biography world: Lyndall Gordon, Edward Chitham, Rebecca Fraser and Juliet Barker, no less, were all present at the table. These great biographers, whose works I have read, discussed their first recollection of reading Mrs. Gaskell’s Life. We heard what new grounds, left untouched by Mrs. Gaskell, they wanted to explore, and what impact this important biography had and continues to have on subsequent biographers. The question time after the discussion ended with the very good question “What would have happened if Mrs Gaskell had NOT written the Life, and who did the panel think might have written the first biography of Charlotte Brontë?” They all had their own interesting and daring ideas, which set us thinking in our turn. The whole evening had been full of exhilarating and thought-provoking ideas and views. As far as I was concerned the talk could have been allowed to go on even longer. Open forum discussions have proved to be very popular in recent years, and this was no exception. There can’t be enough of this kind of events, where individual members have the opportunity to voice their own thoughts about the Brontës. Readings also are one of my favourite events, as the original work still speaks volumes, and on Sunday morning Angela Crow hosted readings from the Brontës, read by Ian and Catherine Emberson, Robert Barnard, Helen Newman, Richard Wilcocks and Alexandra Lesley, who helped to transport us to another world. Sadly, this was the last event I was able to attend; I was unable to join the others on one of the walks organised in the afternoon since I had to catch my plane back to the Netherlands. Pure exhaustion, once back home, seemed like a very fair price to pay after such a brilliant weekend! 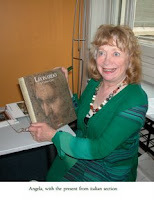 Ann Dinsdale from the Parsonage is looking carefully at the Christies catalogue for the auction in London on July 3. One of the items is a letter from Charlotte Brontë. The recent book auction in Haworth is now well and truly eclipsed. Albin Schram appears to have been a secret collector of mythical proportions. Perhaps Emily’s lost novel will one day be found in the attic (or laundry room) of someone like him. A conscripted Wehrmacht soldier, he escaped from a Russian POW camp in Königsberg, East Prussia, just after the end of World War Two, walked home to Vienna to join his family, became a banker, then settled down in Switzerland. His collection also includes a letter from Napoleon to Josephine, a letter of condolence from John Donne to Lady Kingsmill the day after the death of her husband dated 1624 and one from John Calvin about a friend’s suicide dated 1545. The charming, white-haired Herr Schram was known to auctioneers simply as ‘Henry” and was famous for his stubborn bidding style. I used to go to furniture auctions, where most of the buyers and sellers were known to the auctioneer and it was dangerous to scratch your nose, because you might end up with a worm-eaten table you didn't need. The auction last Friday evening was different. 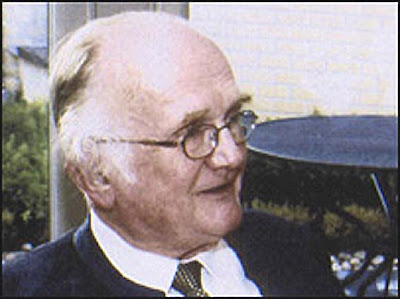 All of the Brontë-related volumes came from the library of the late Arthur D Walker, all of them had his label (with a catalogue reference) on the inside cover, and all the money raised went to the Brontë Society. Each person present was issued with a laminated piece of paper with a number on it, to be raised when a bid was made. Most of the books went for between ten and twenty pounds - a little bit too much for some of them (who cares - all for a good cause), and some were bargains. Others, worth hundreds, were beyond the reach of anybody present - like the second edition print of Elizabeth Gaskell's Life of Charlotte Brontë. Of course, most of those present had a fair number of the titles at home. There was a slightly embarrassing pause when a copy of Rebecca Fraser's Charlotte Brontë came up, because at first nobody made a bid, and its author was sitting at the back. Eventually she called out an offer for ten pounds, and there was laughter. It went for twenty. 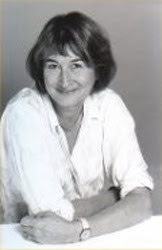 Earlier in the day I had listened to a lecture on writer's homes by Victoria Glendinning (pictured below) - brilliantly entertaining, with insights into her working methods. It is absolutely necessary for a biographer to travel, to soak up atmospheres and appreciate ambiances, to walk slowly around houses, to poke around in garden sheds. She was particularly eloquent about Monk's House in Rodmell, East Sussex, home of Virginia and Leonard Woolf for many years. For much of their stay it did not have gas or electricity, and a little stream ran through it from front door to back door during wet weather. It was very isolated from the metropolis, and Leonard had to go to Lewes for basic necessities like coffee. George Bernard Shaw's house in the Hertfordshire village of Ayot St Lawrence, near Welwyn, she described as a no-nonsense rectory, the interior plain "which is fitting for such a cerebral man". Jonathan Swift's house in Dublin she described as particularly full of atmosphere, hardly changed inside since his day, but in a different landscape because all the narrow streets and old courtyards which used to surround it have disappeared. She could imagine the "hyperactive" writer running up and down the wooden stairs until he was completely exhausted. She wondered about the necessity of some of the rearrangements and reconstructions which have been undertaken in many famous writers' houses - the National Trust has finally stemmed the flow of water through Monk's House, for example - and brought the audience back to the Brontë Parsonage Museum.